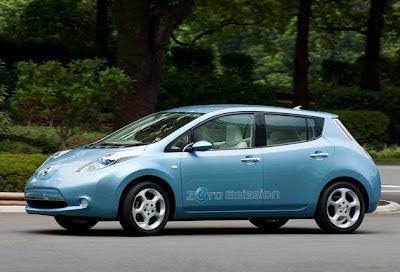 The Nissan Leaf (also formatted "LEAF" as a bacronym for Leading, Environmentally friendly, Affordable, Family car) is a mid-sized five-door hatchback electric car manufactured by Nissan and introduced in Japan and the U.S. in December 2010. The Leaf is the first mass-produced electric car for sale from a major manufacturer. The United States Environmental Protection Agency determined the range to be 117 kilometres (73 mi), with an energy consumption of 765 kJ/km (34 kWh per 100 miles) and rated the Leaf's combined fuel economy at 99 miles per gallon gasoline equivalent.